The 1998 unsolved homicide of Mindy West. 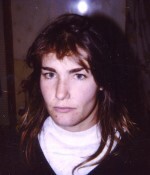 Mindy West was 31 years old when she was reported missing on July 30, 1998. Her body was discovered on October 4, 1998, off of Huse Road, a residential neighborhood of Manchester, NH, tied to a tree, with a rope around her neck. An autopsy revealed that she had been strangled to death. Mindy was transient at the time of her disappearance but was known to frequent the inner city of Manchester, NH.